~Eternal Snow~: Sakura no Ame Project by Halyosy. I'm not sure if anyone remembers of the post I did on a vocaloid song called Sakura no Ame / 「桜ノ雨」 (Click the link for original post of the song). It seems that the maker of the song started a "Sakura no Ame Project", where they attempt to get many people to sing the song together. For starters, it makes the song feel really authentic, since it's a song about graduation, thus you'll expect to have lots of people singing (or feeling) it, since it's something that everybody would go through. Seriously, it's no easy task to get a choir to sing in synchrony, and it's alot harder to try to get unknown people from all walks of life singing the song within the digital world. I'm not sure whether they get individual song files from each person, then try to synchronize it all; or did they have a set gathering to do the recording of the song together at the same time; but they sure did a hell of a job to make it seem so perfect in the finalised version. Damn it's simply beautifully sang. It seems that they are going to have another take at the song with another group of people, and I so want to join in too, but I doubt I'll make the cut (since I think my pronunciation wouldn't be that of the "local" standard). Anyway, without further adieu, here's the finalised version. Sakura no Ame Project - 262 People in Virtual Singing Together Ver. Original Author of Sakura no Ame: Halyosy. 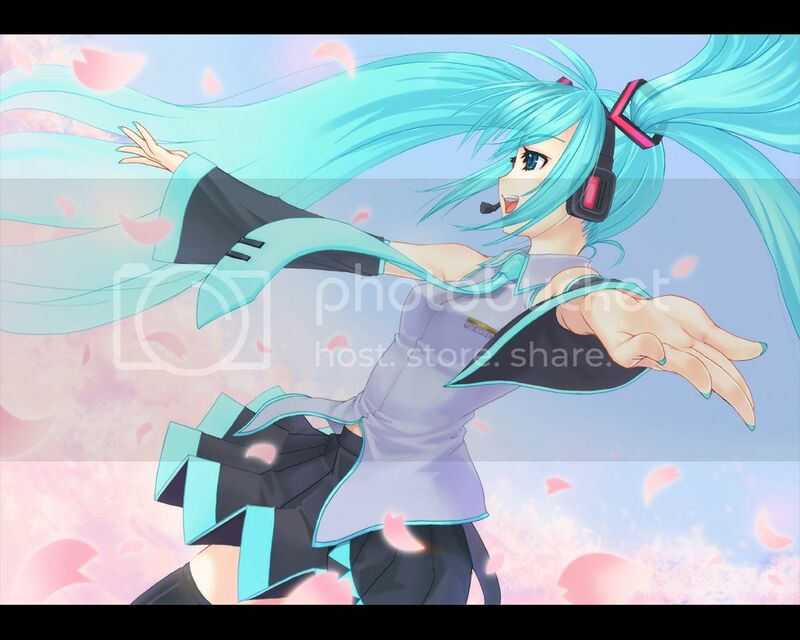 Hatsune Miku - Sakura no Ame, Original Version (for those too lazy to go to my older post). Off topic. People might be wondering if I died after my ORD post, since there was no updates, but it just that my weekend was way too busy to do any post, since I was out more or less the whole time. Today, was also abit busy doing some household chores + clean up room + preparing my luggage for Japan, and getting distracted by some computer game too. Blogger.com didn't help neither, since when I wanted to do this post much earlier, it was giving quite abit of problems. Anyway, tomorrow I should finish clearing my room proper, then I guess I'll be posting my updated room photos. Signing out. Remember to do your clearance properly before S1 decides to reject the paper. What games are you playing? Remember to get the stuff from jpn for me. Do take loads of pictures of the local ladies to share with the deprived geeks. Cleared and gotten back my pink IC, there's no way I'm going back!!! Muahahahaha!!! As for what games, well I started on Championship Manager, but ever since my saved game data got corrupted last night (uguu~ I wanna cry, 2 season's worth), I'm back to doing nothing. I'll be heading to Japan this Friday 6th June night, and I'm sure to bring back lots of photos!! (Might not be lots of girls though) And yes I'll remember your Queens Gate books don't worry lol ^^. Guys will be fine as well. Can share them with my other friend who is someone I prefer describing as a cousin of the Otaku community. Have a great trip. Going to meet Danny? Well... I'll just bring back as many photos as possible ^^. Sadly, wouldn't be meeting up with Danny, since my friend who's going with me is no Otaku, nor does he know of any of these things, so I don't think it's appropriate to request for a meet-up. I would be quite shy too anyway LOL.